It won’t happen often, I promise, but today I thought I would copy and paste what I wrote for my 365 project picture on Flickr. Since today is my blog’s self-designated topic of Writing Wednesday – and the subject matter for the photo fits that theme, I thought it was suitable. While I do not plan to limit my 365 photo project to these prompts, I am enjoying Katrina Kennedy’s January list of helpful suggestions. Today’s prompt is New Beginnings – and here is my response. A new year – a new lease on life. Since kindergarten, I have always considered myself fortunate to celebrate two “new year” celebrations: January 1st and the First Day of School. I supposed I was destined to become a teacher, as my most favorite shopping day of the year is mid-July when I stock up on school supplies. That euphoria has now made its way into my hobby life as well. 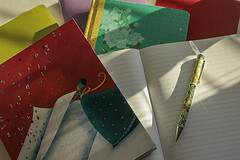 Over the past few years I have discovered a love of writing – and while my preferred method is clicking on the QWERTY keyboard, there is something that draws me to the “old fashioned” method of writing in beautiful journals with decorative pens on the blank page. I have numerous journals waiting for me to put pen to paper – either as notes for future NaNoWriMo stories, or as quotes from treasured reading, or as family stories to preserve for the next generation. There is such excitement about the blank page – and all the potential that it holds; and at the same time there is such fear at marring the pristine page with dribble. This year I don’t want that fear to keep me from realizing the dream of becoming a writer. I want to write – and imagine – and document. This is indeed a new beginning to a fresh start in this second half of life. Happy New Year Molly! Glad to see you back to your writing. You have a gift and it inspires all of us who have the pleasure to read your blog. I look forward to hearing more from you this year! Hi,MOLLY!I look forward to reading more of your blog post. Beautifully written. I look forward to seeing your photos this year! Thanks for mentioning the CY365 list! I already look at you as a writer! !